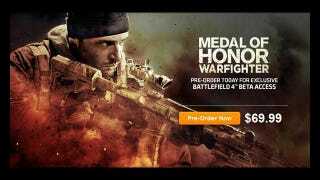 Briefly listed, then quickly replaced, was a billboard on Electronic Arts' own Origin store saying that a preorder for Medal of Honor: Warfighter included "exclusive Battlefield 4 Beta Access." It's not mindblowing that there would be a Battlefield 4—the president of EA Labels, Frank Gibeau, himself referred to Battlefield 4 as far back as November. But the game has yet to be announced, though its turn in the cycle is probably coming in 2013. The beta access is more interesting to me, though it will likely be offered sometime next year, not this. The listing has since been pulled and replaced with a pitch for Battlefield 3 Premium. We've emailed an EA representative for comment; any made will go here.